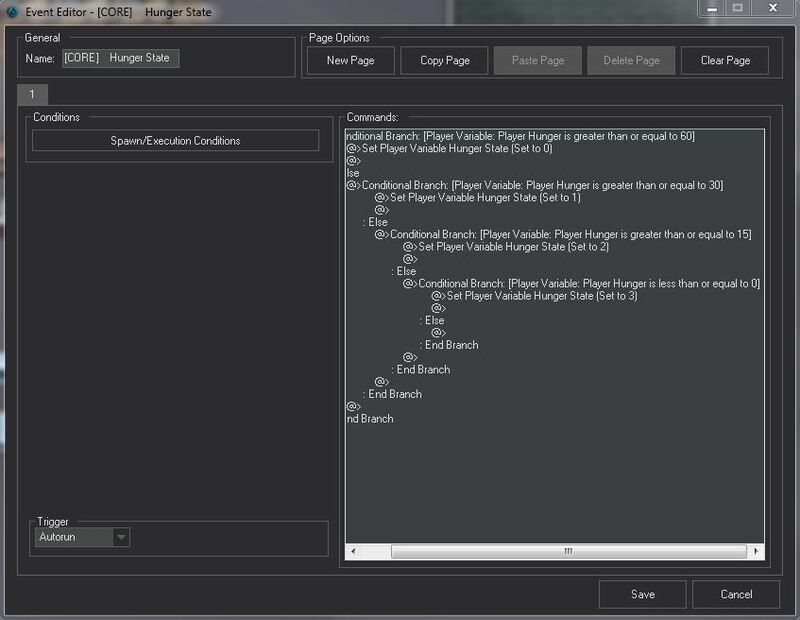 This will enable a hunger and thirst system in your game. Players will then have to find food and water to recover hunger and thirst, but if they don't the character will stop (twice in total) saying you have to wait to recover for a bit (3 seconds). This puts the player in a vulnerable situation in game. If the player still does not get some food or water, they will die and re spawn (Warp / re spawn which ever way you have in your game). Players hunger and thirst will then be reset to 100. This below is a /check command so a player can see there player info, including Hunger and Thirst. 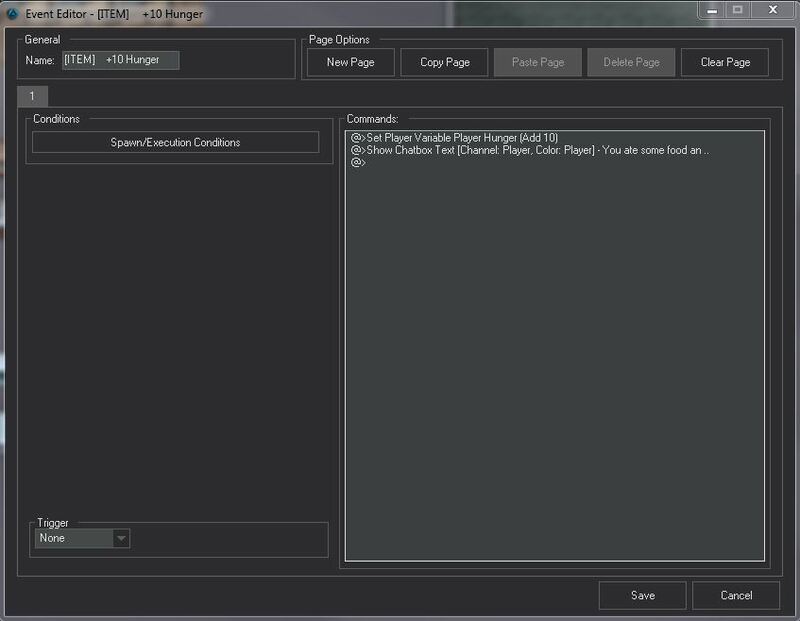 If you have my Journal System installed you can put this info on "Player Information" page. 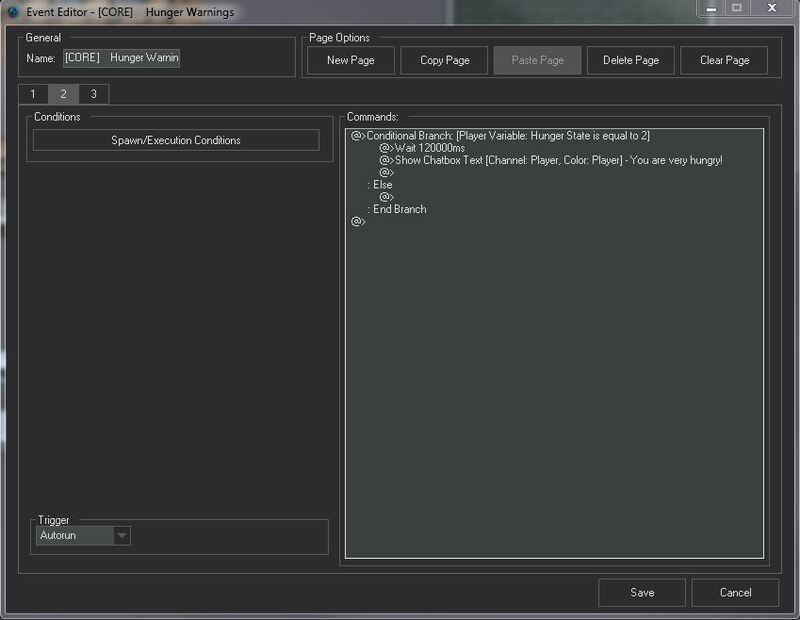 Next we have the player Warnings. 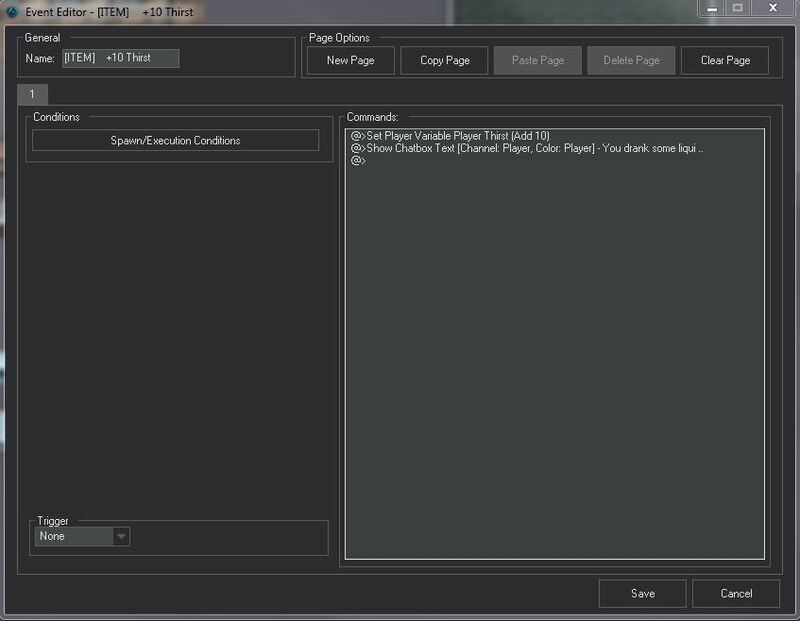 I have increased the speed of the system to get the read outs faster to do this tutorial. Player have 100 Hunger and 100 Thirst. Player loses 1 hunger every 30 seconds. Player loses 2 thirst every 30 seconds. When players hunger or thirst gets to low warning messages start appearing in chat every so often (Doesn't spam). Players in state 3 will stop moving for a short time to recover a bit, this happens twice (stops for 3 seconds). 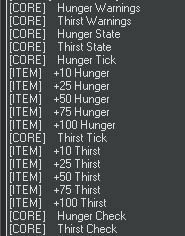 If player does not replenish they will then die and states will be set back to normal: "State 0 - 100 Hunger - 100 Thirst". Sometimes one of the warnings runs after death. Editing the "Waits" in Hunger Warning Events can solve this. 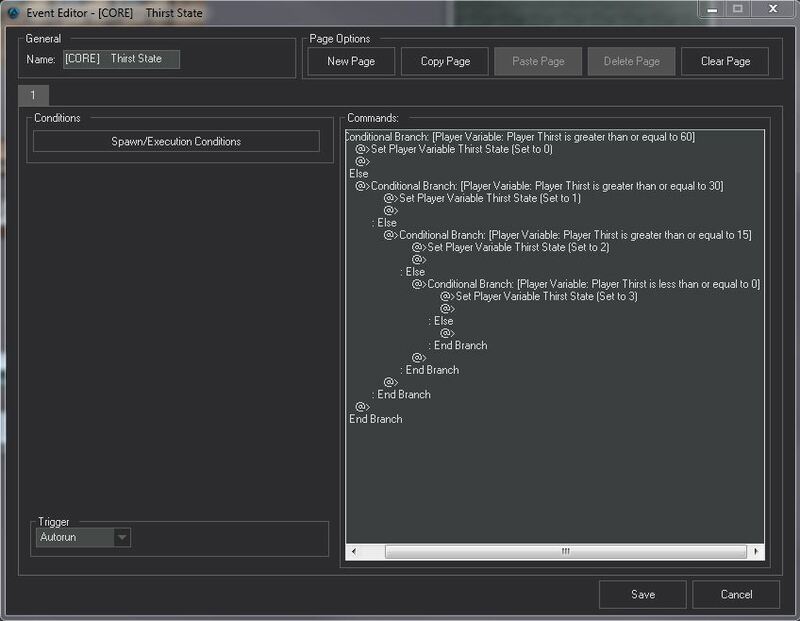 I always layout my event system like this, makes it easier to find events later down the line. Creating a player variable or switch. The ticks are the speed in which players hunger and thirst is reduced and the amount. 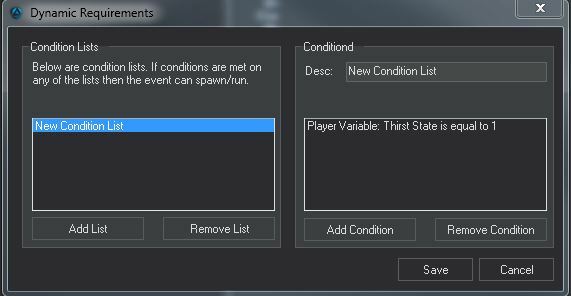 These variables can be changed to suit your game. I believe if my math is correct a player will die in 50 minutes if he does not eat, half that for thirst. Time to do the warnings. Each page of the "Warnings" has a condition to run. Each page needs to only run when the hunger state is equal to the state the player is on. 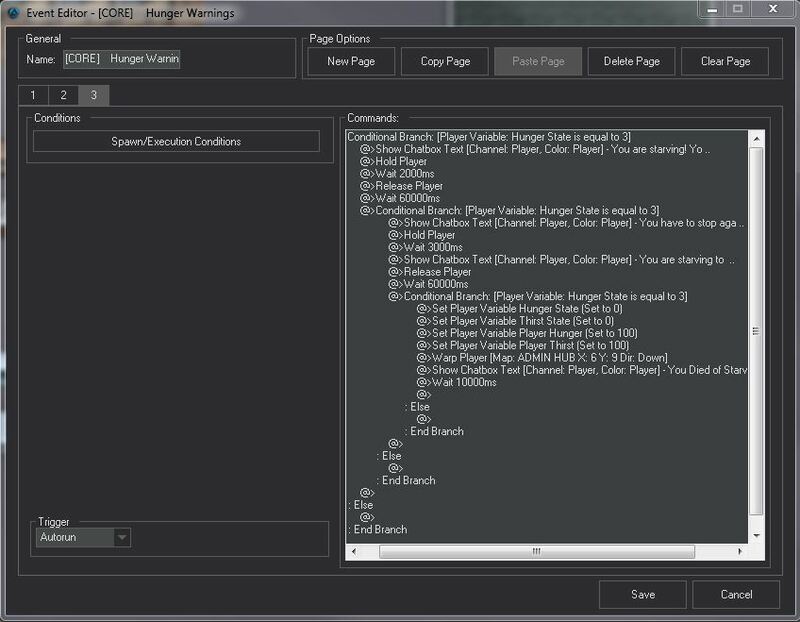 Page 3 does most the work as this is when the player stops 2 times then dies if he doesn't find food. Also here is where you set where the player warps to when he dies. Each page of the "Warnings" has a condition to run. Each page needs to only run when the thirst state is equal to the state the player is on. Page 3 does most the work as this is when the player stops 2 times then dies if he doesn't find water. That is the main bulk of the system. 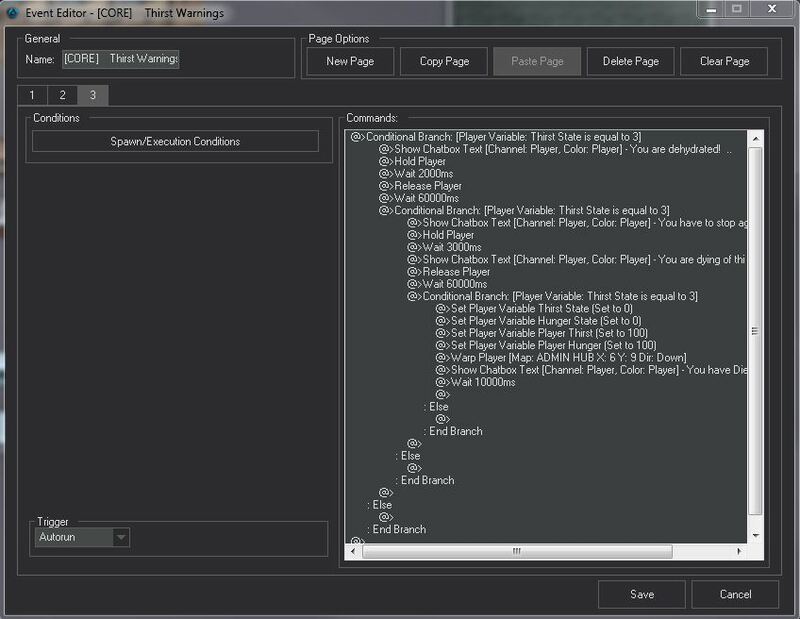 Now we just have to add food and water for the players to consume to recover stats. 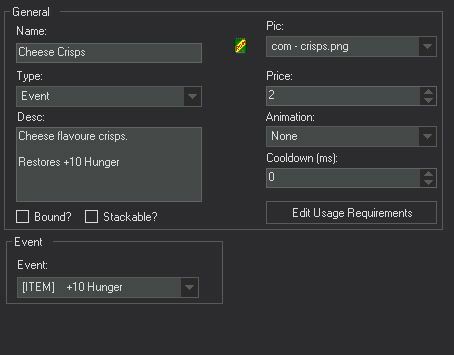 Now make an item and change its type to "Event"
Food a player can consume, some "Cheese Crisps", restores +10 Hunger. 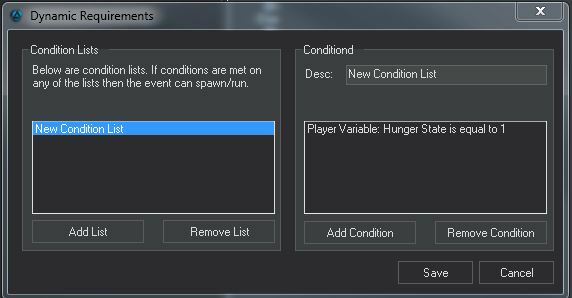 Notice the Event we point to is the common event +10 Hunger. 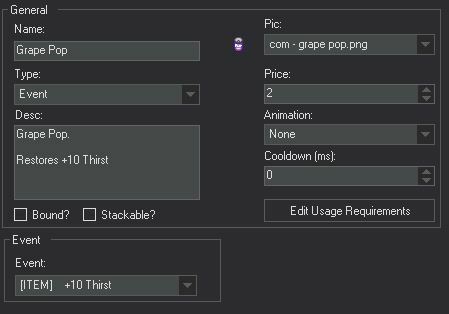 Drink a player can consume, some "Grape Pop", restores +10 Thirst. You should now have a fully working hunger and thirst system. This can be changed easily be changed to make a stamina system or something along those lines. This is a really good in-depth and useful tutorial, thank you very much!